Individuals who have been injured in a slip and fall accident are urged to seek legal counsel from a Newport Beach CA injury law firm to learn more about their options. Below, the attorneys at Russell & Lazarus APC have compiled a list of the nine most frequently asked questions surrounding these personal injury cases. If you have additional questions about the legal process and pursuing a claim for compensation, contact a Newport Beach CA personal injury attorney as soon as possible. Can the city be held liable if I was injured after tripping and falling over a cracked sidewalk? If you can prove that the city failed to properly maintain the sidewalk, you may be entitled to seek compensation for any resulting injuries. However, although cities and municipalities are required to keep sidewalks and streets in good condition and repair when necessary, you must be aware of several requirements and deadlines for notifying the appropriate authorities of potential lawsuits. For this reason, it is important to seek legal counsel to determine the best course of action. Are property owners legally required to remove snow and ice from their grounds? The law does not specifically state whether a property owner is legally required to remove snow and ice from their grounds. On the other hand, should the accumulation of ice and snow result in a slip and fall accident, the patron may be entitled to pursue a claim against the property owner to seek compensation for the alleged injuries. Should the property owner choose to remove the ice or snow himself or herself, he or she must do so to the best of his or her ability. In reference to a property owner, what does the law mean by the term “should have known” when discussing hazardous conditions on a particular property? While there are exceptions, attorneys will allege that a property owner “should have known” about a situation so long as the conditions remained unchanged for a period of time that someone else facing similar circumstances would have discovered them and took reasonable care to correct them. If an employee was warned by a store owner about a slip and fall, but the employee was still injured, can this information be used to build a case? Absolutely. Since the employee has evidence that the property owner knew of the hazardous conditions, this information can help the employee to prove that the property owner failed to remedy the situation, a direct action that caused the employee’s injury. Can I use a verified building code violation to solidify my slip and fall lawsuit? A building owner must routinely check the structure of the building to ensure that it remains in compliance with local building codes such as where and when handrails are installed. If you fall down a flight of stairs, you may have a claim against the building owner if you can prove that the injuries were caused due to the lack of a handrail, and that the building owner violated the appropriate building code by failing to install said handrails. How many defendants may be held liable in slip and fall lawsuits? Many people may mistakenly believe that they can file a lawsuit against only one individual. However, in slip and fall lawsuits, there may be more than one party or entity whom you may hold liable for your injuries. For example, if you are injured on a property and the business is renting the space from someone else, both the business (tenant) and the property owner may be liable for injuries that occurred on the grounds. 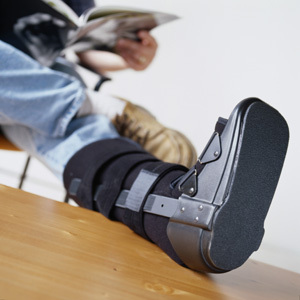 Is legal counsel necessary for my slip and fall lawsuit? While you may feel as though legal counsel is not necessary and that you can adequately represent yourself, the reality of the situation is that personal injury laws can be complex, and you may find it difficult to prove liability in your slip and fall lawsuit. An experienced Newport Beach CA injury law firm will be able to review your claim and determine whether you have grounds to build a case. If you or someone you love has been injured in a slip and fall accident and you would like to learn more about your options, contact Russell & Lazarus APC to speak to an experienced attorney. The attorneys at Russell & Lazarus APC can help to answer your questions and assist you if they find you have a claim. For more information, call the Newport Beach CA injury law firm of Russell & Lazarus APC at 949-951-0222 to speak with an experienced attorney.